Katie, Katie give me your answer true, I’m half crazy just for the love of you. so glad you said I do! The big day had finally arrived, one of the most anticipated events in the last 30 years!!! At first light the campers started to wake, spectators began to arrive and the dust rose into the air in swathes!!! and we kept an anxious eye on the weather!! As the morning progressed the excitement mounted and the crowds swelled. They had been expecting an estimated crowd of 600,000 on the Processional route, in the event it swelled to over 1million! I do believe that the reality of the importance of the occassion had started to sink in as the day wore on and as the excitement set in……this was our future King who was getting married! Diana’s eldest son and 2nd in line to the throne! How could you not be there!!! The Mall was closed off, the Metropolitan Police, lunch packs in hand, started spreading out into their marked positions. Armed-Police marched by, some heading for the roof of Buckingham Palace, snipers and marksmen all positioned on the corners of the Palace roof. 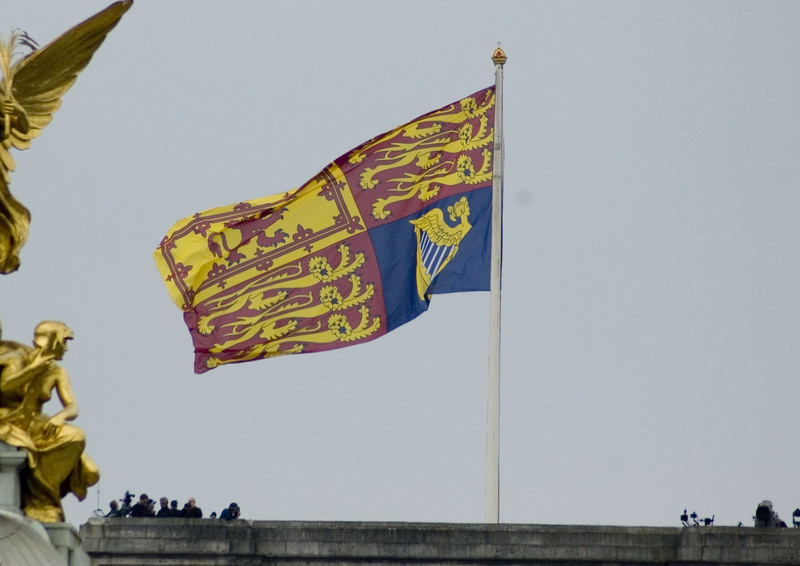 Suddenly we noticed that the Royal Standardwas aloft! Reporters reported; interviewing anyone they thought looked suitably attired or somewhat crazily quirky- and there were many to choose from!! Street sweepers went by to roudy applause, the crowd cheering anyone who walked by. 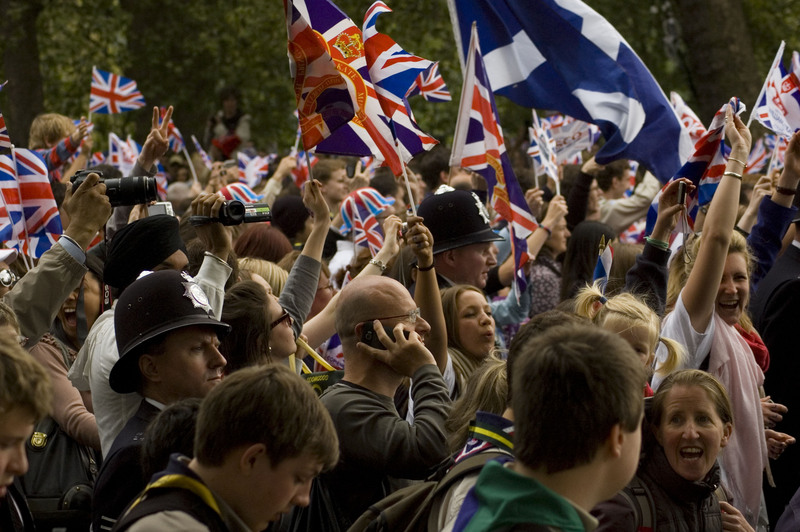 We had Mexican waves, we had cheering, we had more and more people trying to squeeze into tiny spaces, the flag waving increased in intensity and the volume of sound swelled to deafening proportions. And you did not dare to leave your place to go to the loo!!! 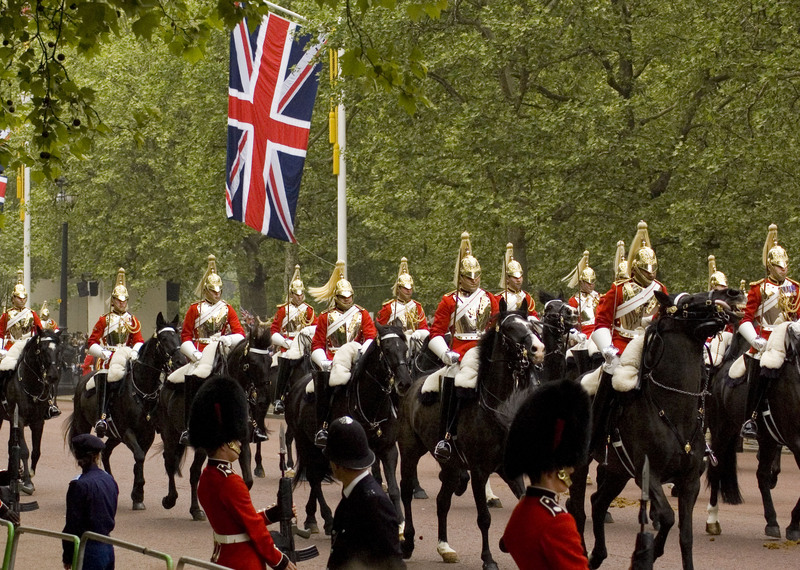 When the first of the Mounted Police rode by the sound swelled, when the Marching bands went by, the cheers escalated, and when the first of the Royal Family; Princes William and Harry left Clarence House the crowd roared! flags waving energetically. Suddenly time had marched on and there was the car with the Maid of Honour; Pippa Middleton and the bridesmaids, and now we knew for sure that within seconds the girl we had been waiting to see with bated breath and rising anticipation was on her way. The excitement rippled like electricity through the crowd!! And suddenly the level of sound rose with an enormous roar!!!! Kate was on her way! And finally there she was, looking radiant and exquisite, every inch a Royal Regal lady; born for this position.. smiling beautifully behind her veil she elegantly waved with evident happiness! Her father beaming proudly at her side. The crowd cheered and cheered, tears flowed and we all had one thought on our minds; her future. There she was, one of us, and within the next hour she would be one of them! Our future Queen-in-waiting, and she looked it! 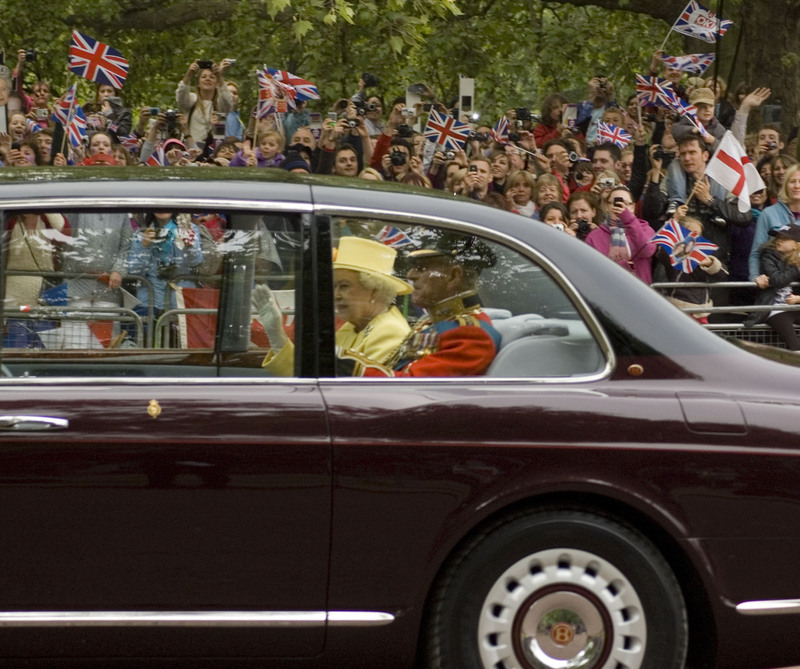 Within seconds the car was gone, enroute to Westminster Abbey and the moment her life would change irrevocably! She would soon become one of the most photographed and talked about women in the world, on a par with our Diana and we all loved her! Loved her because she had brought a sparkle to William’s eyes, a lovely girl who loved him, and it showed! As the music flowed from the speakers the crowd fell silent and you could almost hear a pin drop as the crowds waited for the ceremony to begin. Next we heard the voice of the Archbishop of Canterbury; and as William said ‘I will’ the crowds cheered, but that was nothing compared to the roar of the crowd as the soft trembling of Kate’s response came through the loudspeakers. Deafening! She said ‘I will’ and the country roared! What a brilliant moment; a historical moment, a moment that set the seal on a future that we can only imagine, and never truly comprehend! And I was there!! I will never in all my life forget the feelings and the emotions I felt in that moment, and as she said ‘I will’ the sun shone out from behind the clouds, just a short burst and I knew that Diana was there!!! The rest of the service passed in a flash as we sang the National Anthem and then the words of ‘God Save the Queen’ rang out, voices raised in lusty jubilation, patriosim at it’s very best. Soon the formalities were over and as they left the Abbey, once again the sun shone out, the rays no match for the smiles on the faces of these two young people, happily in love and happy together!! William proud, and Catherine, as he had said at the altar; “beautiful”. 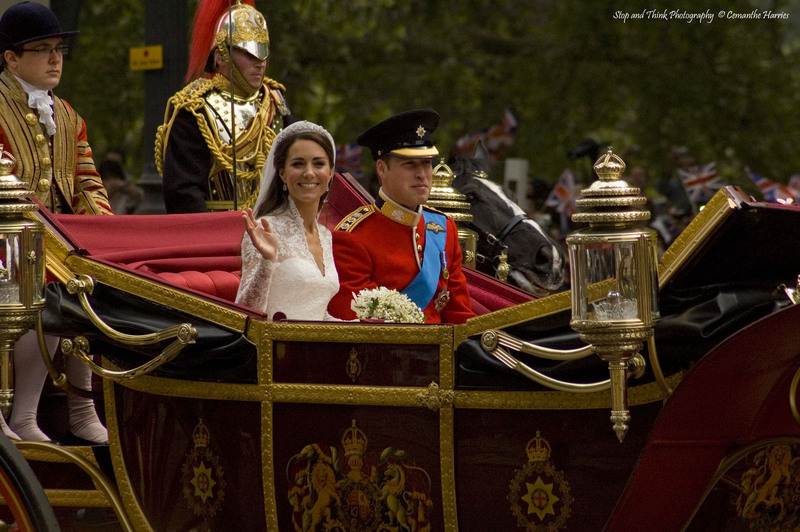 The exhuberation as the carriage procession made it’s way along the Mall to Buckingham Palace, along the Processional Route was electrifying, powerful and emotional. I got so excited by the magnificence of the horses, barely controlled at galloping-trot or whatever style of motion it is called; overwhelming! You could feel the energy of the moment, the sheer power as the carriage swept by, preceded by these magnificent creatures that looked as if they would break loose at any second! The smiles, the radiance of the bride, regal and royal, the elegant wave of a dainty hand and the pride on William’s face! All too soon they were gone, followed closely by the rest of the wedding party; Pippa and the bridesmaids, Prince Harry and the page-boys, the Queen and Prince Philip in their glass coach, then Charles and Camilla with Mr & Mrs Middleton, and then the coaches with other members of the Royal Family. 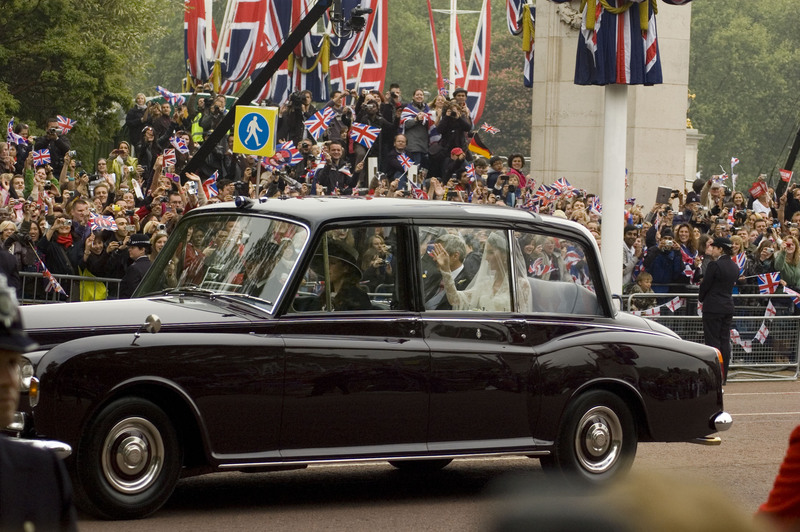 Once they were all safely tucked up inside, a wave of humanity surged along The Mall, controlled, yet eager, thousands of people preceded by Her Majesty’s forces heading for the Palace. It’s is a sight so surreal, it’s hard to imagine. The crowds moved inexorably forward and the crush became almost too much to bear as people surged forward in their desire to stand below the balcony where the newly-married couple would soon appear. I so remember the moment Diana and Charles stepped out onto that balcony almost 30 years ago and the feeling that came with it, and now here I was just metres away about to watch her son step onto that same spot his parents had stood all those years ago. And of course the main reason for the excitement………..the kiss!!!!! Would they? Or would they not? But they did, and the crowd went wild, kiss her again they cried and he did, to a roar of approval and jubilation like no other! The heavy drone of the fly-past competing with the roar from the crowds; and then it was all over. 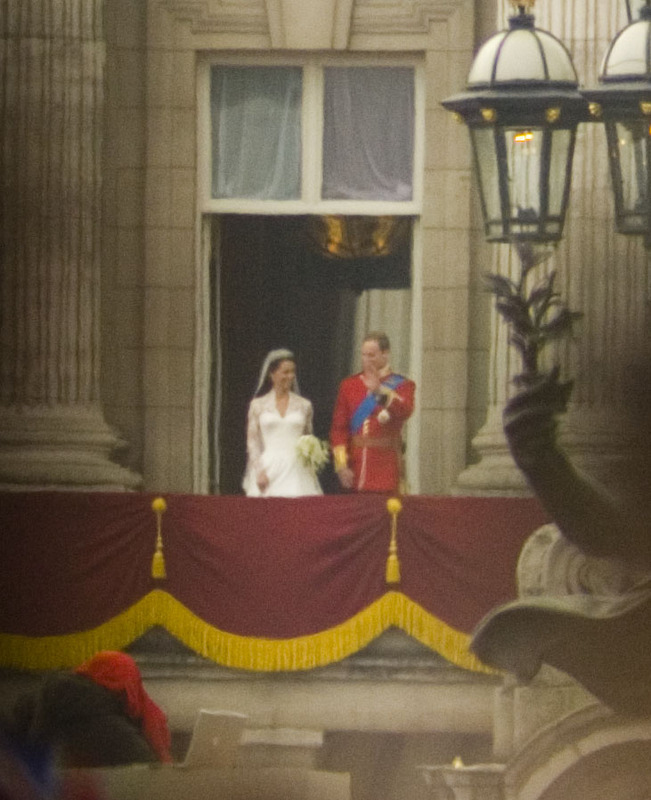 The Royal Family, preceded by the Queen left the balcony to continue their celebrations in private. I loved the moment, as seen on TV, when Catherine walked out onto the balcony; her gasp of surprise was delightful. And I cannot begin to tell you how fantastic it was to be standing there, part of this celebration of such momentous importance and joy. It is something I will never, ever forget! A day to be remembered and celebrated, I hope, for decades to come! What a superbly written piece, Cindy, well done! I may not have been there on the day (I was in fact in the middle of Africa, watching some very ‘royal’ looking owls 🙂 ), but felt the excitement in your words and actually got tears in my eyes by your description of her “I will”, I could actually feel my skin tingling!! Thanks for a brilliantly wriiten blog! What a treasure of a piece! Thank you for sharing. Knowing that you actually took the photos is amazing. You did very well. My niece was there but opted to stay in Hyde Park to watch on the Jumbo-Tron…and yes, I got up early CST with friends to watch as I did in ’81 and ’86. Idea: I plan to self publish my family stories that I’ve created on wordpress and give to the family when I reach a good number. This would be a super piece to include in something similar if YOU choose to do so for the kids and the grandkids. Hi Georgette 🙂 thank you so much for your lovely comment, so glad you liked it. I would have gone to Hyde Park and as it transpired we could only hear the ceremony so I only got to see the Abbey scenes on the TV later, but it was an amazing experience and something I will never forget. I can’t take credit for the photos….they were taken by my daughter (see credit at bottom of the blog). Simply wonderful; thank you for sharing this with all of us and for commenting on my post about why the Royal Wedding resonated with me. I loved your pictures too and oh to be right there – how fantastic is that 🙂 You will remember that always.